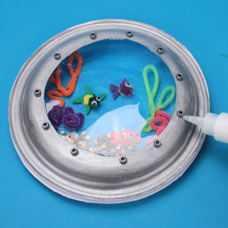 Decorate your space for some creative play when creating a colorful underwater porthole using paper plates! 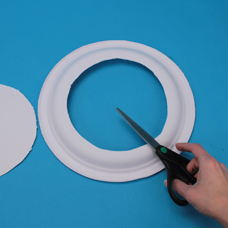 Have an adult use heavy duty scissors to cut a large hole in the middle of a paper plate, as shown. Turn the cut plate over and paint it silver. 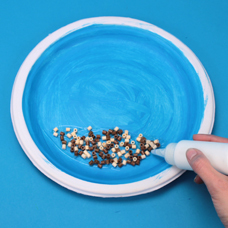 Paint the middle of another plate light blue, which will represent water. 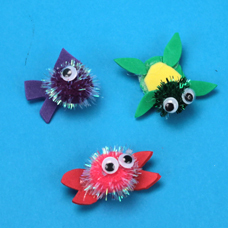 Make a few sea creatures for the porthole. Click here to learn how to make these designs. 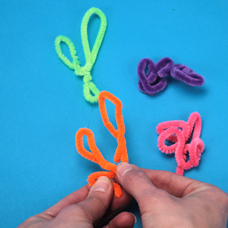 Twist some Fuzzy Sticks into interesting shapes to look like pieces of colorful coral. 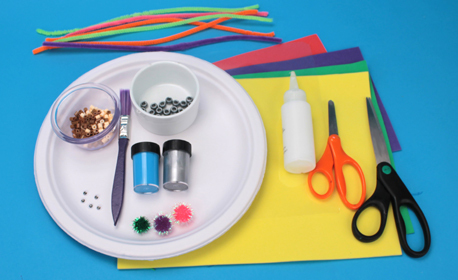 Glue brown and tan Melty Beads along the bottom edge of the blue plate to create sand for the ocean floor. 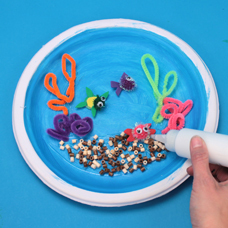 To complete your underwater scene, glue the sea creatures and coral to the blue plate. Tip: don’t glue any of your shapes on the rim on your plate. Trim a piece of plastic acetate so that it is a little larger than the hole in the silver plate. 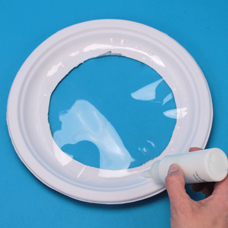 Turn the silver plate over and glue the acetate to the plate, as shown. 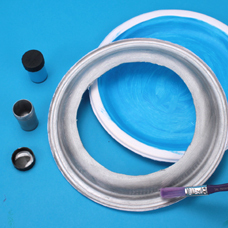 Acetate is a clear material which can be purchased directly from an office supply aisle or recycled from packages for toys, tools or other plastic covered items. To finish the porthole, glue silver pony beads around the opening to look like nuts and bolts. 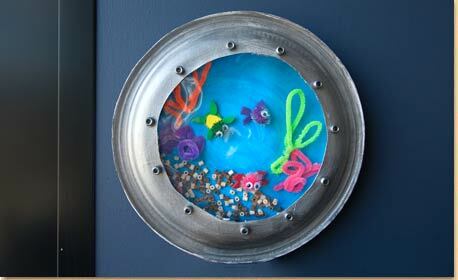 To display, hang the porthole on a wall and pretend you are on an underwater adventure!